Home > Who Cares > What Does Being A Carer Involve? Being a member of a functioning family or even a good neighbour probably means that to some extent you are already a carer. If you are concerned with the well-being of someone else, then you care for them but if you are actively involved in their well-being, then you are a carer. You can become a carer of someone who lives with you, lives nearby or lives far away. It often happens without you even noticing. Initially, perhaps a member of your family or a close friend is diagnosed with a serious illness and you are the only person in a position for caring for them. Maybe, you offer to give a lift for hospital appointments or to get shopping. As time goes by, instead of helping on the odd occasion, you discover that you become more of a personal assistant, caring for all areas of the person's life on a daily basis. Although this will still involve shopping and hospital appointments, it could also involve paying bills, arranging personal care, meals on wheels, house cleaning and pet care. In some cases, probably with a member of your family, often an elderly one, it could involve toileting, bathing and feeding the person who is unwell. Caring is effectively helping another person do those tasks that they are no longer capable of, or never have been capable of, doing alone. As a result, the life of a carer often becomes severely restricted by a variety of caring responsibilities. These additional tasks can be difficult, unrewarding or time-consuming and frequently have a detrimental impact on the carer's health, social life and financial situation. Although caring for the needs of someone may be due to illness or disability, much caring is required due to an aging population. In recent years, there has been little change in the number of people reaching the age of 65 in the western world, but the number of those reaching 80 has soared. At the age of 80, one in five people show signs of dementia and there are a myriad of other illnesses and debilitating conditions that predominantly concern the elderly. As people get older and their health deteriorates, it is understandable that they will need increasing elderly care to be able to enjoy their lives and maintain their independence. 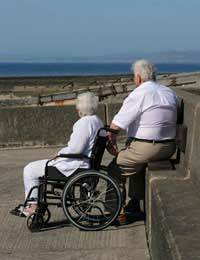 Having been autonomous throughout their adult years, caring for an elderly person requires sensitivity. Also, if you are involved in elderly care, it is quite likely to be a parent or relative who has been more used to looking after your welfare. This change in family relationships can be tricky and needs to be handled carefully to avoid conflict. The elderly person will probably want to make their own decisions to remain as self-reliant as possible until the end of their days. Often, given a little attention and an appropriately designed environment, their desires can be fulfilled; the elderly can continue to experience a good quality of life and be integrated into their community. But if you are their carer, organising the necessary services to achieve this goal will involve a lot of time and patience - with the outside organisations as well as with your relative. Elderly people often resent the help they need and caring for them can be especially difficult emotionally. Caring is a broad school and one that is rapidly growing in the United Kingdom. It is estimated that two million people become carers each year and that it will affect three in five of the population at some stage in their lives. Most people who become involved in the care of another, undertake the role through duty or affection without any expectation of being paid. Nevertheless, a recent report from the charity Carers UK estimates that in their unpaid role, carers save the State £87 billion annually and that without them, health and social service spending would double. We are lucky in this country to have many organisations that can give guidance in helping us provide for another's well being. But it's a question of knowing where to go and to whom. Caring involves a tremendous number of different skills and is often a long term, arduous and frequently exasperating occupation. Hi I work 35 hours a week as well as look after my husband who has asbestos related disease COPD and heart failure as well as diabetes. My union at work has said if I register myself as his carer I can at a later date if needs be alter my hours as work. I'm not after any extra money as its my husband and I earn over the £120 a week anyway. I just need to know if someone can help how to register myself as his carer and maybe what help I can get for this. You can find out all you need to know via the gov.uk link here . my wife is my carer as I have certain physical probs. I am still able to dress and look after myself in other ways . I also have mental health probs. my wife wishes to move into a retirement village in Adelaide where there is 24/7 medical care plus we have family there. my wife also broke her left leg a second time . I am unsure about this move to Adelaide as I don't think I will get a job there or be able to find my way around. I would like to know what other ppl think. I have elderly parents who have always been controlling and rather oppressive; I live a long way from them now but visit frequently. My sister and myself have made it clear that we will not provide 24 hr care although that is what they would like. My stepmother is very like Pennymint's mother above, she does not want others involved in her care and is very difficult. I think it is very important to put strong barriers in place, elderly people who expect their children (often aged themselves) to completely put their lives on hold to care for them are extremely selfish and manipulative and thay need to be handled with compassion but also firmly otherwise they will just keep taking and drain you dry. As a Christian, I did a lot of soul seaching about our family situation as I used to be made to feel very guilty, now, after much prayer, I do what I feel able to and I don't feel guilty; guilt is a horrible emotion that can eat you up and cause a lot of resentment. Penny mint, your comments certainly strike a chord. My situation is thus. My father is 96 and managed living on his own up until Nov 2012. Up until then I had done his shopping, laundry and housework, but he saw it as still being independant. Unfortunately he suffered a stroke in Nov. we were told that he would not survive, but indeed he made great progress. He was in hospital until the end of December when he came to live with us. We knew he wouldn't be able to go home. I was initially offered a package of care for his discharge, but when the time came I was assured that he wouldn't need any help and in fact, he would be able to go back to his own home in a few weeks! I soon found out that wasn't the case. Dad went downhill rapidly and I found myself having to give 24 hr care. Lost all my freedom. Ironically I have cared for my disabled son for the past 21 years and he moved into a supported house 2 weeks before my dad had his stroke! I looks feet my grandson 3 afternoons a week too, but my dad was resenting that also. He became more and more demanding and ungrateful. Eventually after only 5 weeks I was at breaking point. I spoke to the district nurse, GP and social worker and somehow or other they managed to get my dad to agree to go to a nursing home. I couldn't believe it! My dad has always refused every type of help apart from mine. So we moved him into the home and from Day1 he hated it. Stubborn wasn't the word. He went on hunger strike, refused to let the carers do anything for him and just cried every day when I visited . He called me awful names and was very nasty to me. I just didn't know what to do. We suffered it for 4 weeks, but the result of his self imposed regime is that he has improved immensely. There was only one solution. He moved back in with me, but this time I have carers coming every morning for his personal care and every other day for a lunch call, so I get some 'me time'. The agreement that he came back here was on condition that he goes into respite when my husband and I need a break, and I will stick to that. We have a life and a family besides dad and I need to spend time with them too. I think you have to stand firm. It's tough at the best of times, but having time to yourself to look forward to, makes it a little easier. I am nearly 66, retired in good health and have been very happily married for 45 years.My husband is also in good health and we hoped that in our retirment years/the autumn of our lives we would be able to go on lots of breaks,holiday abroad in the winter..even buy a camper van and take off for weeks on end travelling the U.K., perhaps even taking our little 5 year old grandson (the light of our lives!) away with us at times.He lives 40 miles away and up to him starting school we saw him once a week, but now it will only be a case of occasional visits. We have no other grandchildren and just the one daughter.) Alas, all our dreams will not be possible because, as an only child I now have to consider the care of my mother.Mum, who still lives in her own home,has suffered from a broken hip in the past, and is currently in a rehab bed following a fracture to her other hip/diagnosed with osteoporosis. She is fully composmentos, is reallly adamant that she does not want to go into a home(even to give us a short break!!) and talks about not being wanted when I suggest that my husband and I would like to have a couple of days break every six weeks or so. ( I do all her shopping, heavy cleaning, help her with the laundry, take her to appointments etc and my wonderfulhusband is very supportive as well, doing her garden with me and all her odd jobs (including putting her a new bathroom in in his first weeks of retirement!) She simply cannot (or won't!!) understand why we need to go on holidays.I can understand her desire to remain in her own home and I will support her when she goes home from the rehab bed (I will have to probably sleep there until she is feeling better in herself).She is able to dress herself, but at the moment sometimes does need help, and is able to strip wash, although I do her back and feet as she cannot bend. I assist her if she takes a shower. She is NOTincontinent, and before she went into hospital a month ago was able to make simple meals/supplemented by me taking her hot meals occasionally/ready made meals.I am trying to take each day at a time, but I am really dreading the future if I have to tell her that things are too much for me and that I can't care for her "round the clock".Yes, there are support services out there and I have told her that she may well have to have some help, but my mother is a very strongwilled/determined character and I just KNOW that she will not like others visiting her at home.She has no friends to support/call on her..has never been a "joiner" of groups and tells the nurses that I am her "best friend"!!!! !She did once join a support group but only went to three sessions, stating that it was not for her and she didn'tlike the organiser!!! !Is there anyone else out there who has had the same problem as me and can give me some tips on how to handle the situation? ?Thank you. I have been looking after my elderly aunt for some time now and I am finding that I am doing more and more for her, as she is unable to carry out some of the tasks and activities she used to manage. She has just recently been diagnosed with Alzhiemers dementia, although I suspected that she was suffering from some type of dementia for along time prior to being officially dignosed. I sort out and administer her medication and take her to hospital appointments, visits to a friend and hairdresser. I also do the food shopping and cooking although she is still able to make herself a hot drink and sandwiches. I tend to her garden and help with organising payment of household bills to which I contribute as I now live in. I collect her pension on a weekly basis and make certain that all her needs are catered for.